> It is now generally understood when and why fish stocks become depleted. 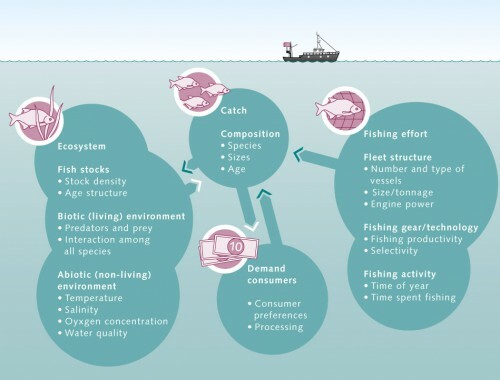 Global demand for fish and the intensity of fishing activity are known to be key factors in this context, but ecological aspects also play an important role. 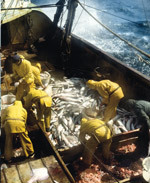 The influencing variables need to be studied in more detail, however, in order to provide a conclusive explanation of the causes of overfishing. Consumer demand and fishing effort indirectly affect the marine ecosystem as well. Depending on the volume and composition of the catch, the age structure and density of the fish stocks may change, and this can affect the coexistence of the various species of marine flora and fauna. The implementation plan adopted at the 2002 World Summit on Sustainable Development (WSSD) in Johannesburg established the maximum quantity of fish that can be harvested annually with a view to protecting the world’s stocks. This is known as the maximum sustainable yield (MSY). The MSY is the maximum annual catch that can be taken from a species’ stock over an indefinite period without jeopardizing that stock. The volume of the catch that can be sustained over an indefinite period depends on the size of the stock. For many stocks, the size of the stock that would permit MSY is equivalent to around half the natural equilibrium stock without fishing activity. As fish species vary in terms of their commercial value, the economically relevant variable is not the weight of the catch in tonnes but the value of the fishing yield. Fishing costs are the second major economic variable in a given fishery. An increase in fishing effort leads to higher operating costs due to the costs of increasing inputs such as wages, fuel and fishing gear. As a consequence, fishing is particularly profitable if the difference between the fishing yield and the total costs is sufficiently large. 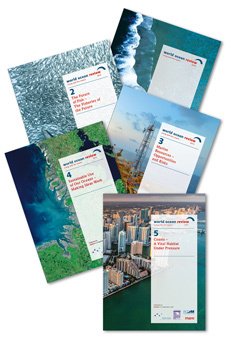 Analogous to the MSY, the value of the largest positive difference between total revenues and total costs of fishing is known as the maximum economic yield (MEY). 6.10 > Schematic overview of a marine fishery. The white arrows show the route taken by the fish from the sea to the consumer. The dark-green arrows show the impacts of consumer demand and fishing effort on catch volumes and the marine ecosystem. From an economic perspective, the problem of overfishing arises because marine fish stocks are a “common” resource: a fish, once caught, belongs to the fisherman, whereas a fish that is still in the sea does not. Viewed in economic terms, a fish in the sea has value by virtue of the fact that it reproduces and continues to gain in weight, which means that the fishing yield will increase in the future if the fish stays in the sea. So there is a price associated with catching the fish because this value is lost. In the case of overexploited stocks, which are in particular need of recovery, this price may even exceed the market price obtained for the landed fish. As fish stocks are a common resource, however, in an open and completely unregulated open-access fishery no one ever pays the true economic price. For that reason, the economic costs of fishing are underestimated and far more fish are caught than is economically sensible. If a fish stock is of a size that permits the maximum economic yield (MEY) to be achieved, there is a strong in­­centive for individual fishermen to deploy additio­nal vessels or work additional shifts in order to increase their per­­sonal earnings. This means that in an open fishery, the fishing effort will be scaled up until it is virtually impossible for any fisherman to generate any profits at all. Furthermore, state subsidies allow the fishery to be maintained even when the direct costs of the fishing effort have already exceeded the value of the fishing yield. Fishermen’s individual operating costs are reduced in many cases by direct or indirect subsidies. Every year worldwide, more than USD 10 billion is paid to fishermen in the form of fuel subsidies or through modernization programmes, with 80 per cent of this in the industrialized countries. According to calculations by the World Bank, the global fishing effort should be reduced by 44 to 54 per cent in order to maximize total economic benefits from global fish­ery, i.e. in order to achieve maximum economic yield. The World Bank currently estimates the loss of future net benefits due to overfishing to be in the order of USD 50 billion annually – a substantial figure compared with the total annual landed value of fish globally, i.e. around USD 90 billion. A further major difficulty for successful regulation of fishing, in terms of the maximum economic yield (MEY), is ongoing enforcement and monitoring. If a particular fishery is highly profitable, fishermen may be tempted to drive up their earnings by making illegal landings. Around one-third of all fishery products reaching the market are estimated to come from illegal fishing, or fishing activities that circumvent international agreements. obstructs efforts to conserve and maintain fish stocks. IUU fishing is not just carried out by a few private entrepreneurs who deliberately violate the law and others’ fishing rights. It also involves vessels registered in countries whose own standards do not meet those adopted by the international community or who lack the capacities to establish control mechanisms. Illegal, unreported and unregulated fishing therefore mainly harms artisanal fishe­ries in the coastal regions of developing countries. The annual global economic cost of IUU fishing is estimated to be at least USD 10 billion.